]] The Lao People's Liberation Army Air Force (LPLAAF) is the air force of Laos. The present-day LPLAAF is descended from the Aviation Laotienne, which was established by the French and later became the Royal Lao Air Force. 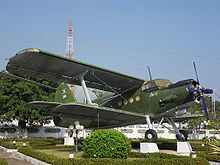 Pathet Lao guerrilla forces began to operate a few aircraft from 1960, as did another rebel group led by Kong Le. Kong Le forces were later re-incorporated into the Royal Lao Air Force. When the communist take-over in, 1975, resulted in the adoption of the present title. Military co-operation agreement with Russia in 1997 resulted in 12 Mil Mi-17(second handed)helicopters that entered service in mid-1999 to follow on from previous deliveries of Mi-8s. SAM systems also entered service such as the SA-3 'Goa'. The LPLAAF operates from two main bases - Vientiane and Phonsavanh - with another three bases supported by detachments from the main units. Apart from the main military air bases, there are also a number of smaller airports and airfields around the country which are frequently used by the Air Force and the semi-military airline Lao Airlines. In 1961 Laos had 25 airstrips capable of taking a C-47. ^ "Lao People's Liberation Army Air Force". aeroflight.co.uk. Archived from the original on 18 January 2017. Retrieved 15 July 2016. ^ a b c d e f "World Air Forces 2019". Flightglobal Insight. 2019. Archived from the original on 23 January 2019. Retrieved 12 March 2019. ^ "Laos joins Yak-130 operators list". flightglobal.com. Archived from the original on 25 March 2019. Retrieved 25 March 2019. "OrBat Laos - MilAvia Press.com: Military Aviation Publications". milaviapress.com. Retrieved 15 July 2016. This page was last edited on 2 April 2019, at 14:44 (UTC).